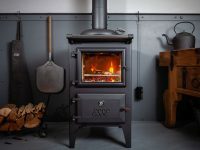 If you’re looking for a stove or fireplace that matches top notch craftsmanship with unique Scandi-style, then we highly recommend taking a look at our range of Jotul products. Jotul is a Scandinavian company that develops and creates high quality fireplaces and stoves and has done so since as early as 1853 – making it one of the oldest wood fired stove manufacturers on the planet. They pride themselves on robust craftsmanship that mean that each stove and fireplace adhere to only the finest of standards that have been built up over 160 years of production. With a rich and illustrious history to draw on, Jotul strike a delicate balance between traditional classic designs that are bold and strong with modern features that make them one of the most popular manufacturers around. However, what truly differentiates Jotul from other manufacturers is that each and every one of their products are handmade in Norway by skilled craftsman. Jotul uses only cast iron to create solid and high-performance stoves and fireplaces that are widely established as being some of the most reliable products on the market due to the maximal durability and longevity of the material used. Being crafted in the cold climates of Scandinavia, where temperatures plummet their stoves are carefully designed to give off huge amounts of heat in the colder months of the year. Jotul provide a wide range of products in varying sizes and have options for multi-fuel, gas, or wood fuel to keep them burning bright. They also come in a variety of styles from traditional homely designs to the stylish and avant-garde. Many of Jotul’s stoves are designed with DEFRA rules in mind. Specific Jotul models are DEFRA approved meeting their strict guidelines which allow owners to burn wood in their stoves, even in designated smoke control zones. Here at W & H Supplies we stock a large number of multi-fuel and wood burning stoves, including appliances from the likes of Aga, Barbas, Dovre Stoves, Jotul, Stovax, Yeoman Stoves and many others. Visit us in store or call us on 01903 885566 to find out more.